The Tank Museum brings the history of tanks and tank crew to life, supported by the world's best collection of tanks & boasting action packed live displays during school holidays. Exhibitions tell the story of armoured warfare spanning almost 100 years of history. As you explore the Museums 6 large halls, you will come face to face with over 200 vehicles that have seen action in all the major wars of the 20th Century. This unique collection of over 200 vehicles includes the world's first ever tank, the Tiger tank, and the modern Challenger 2. Tanks were invented in Britain, and first took to the battlefield during World War One. Wherever wars are being fought, you'll find tanks. From the Somme to Desert Storm, and even at Tiananmen Square, tanks have played a pivotal role in many of the great turning points in history. The Tank Museum has been the subject of a £16m Heritage Lottery Fund sponsored redevelopment project, which was completed in early 2009. New features include a major new exhibition in a purpose built display hall, new tank arena, shop & restaurant, and vastly upgraded visitor facilities. 'The Tank Story' exhibition is the key element of this project and tells the story of the tank from its World War One origin to the future. New multi-media interpretive material better places the development of the tank in context with global events; hands on exhibits with new audio visual materials and veterans accounts are integrated into the storyline to illustrate the life of tank crews within the narrative of conflict. The Supporting Collections are given new prominence with uniforms, small arms and memorabilia redisplayed alongside vehicles - all helping to improve the way the Museum tells its awesome story. The Trench Experience allows you to walk in the footsteps of a World War One solider from the recruiting office to the front line. In the Discovery Centre, you will find out how different tanks are used in different ways and learn what it is like to be a tank crewman. In our arena you can get closer to the action; see the awesome tank action displays during school holidays - and experience for yourself the thrill of riding in a tracked vehicle. 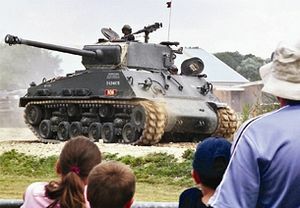 The Tank Museum hosts a number of special events thought the year. The most significant of these is Tankfest (weekend of 27th & 28th June), where the past explodes to life in a weekend long demonstration of moving historic armour, living history displays and mock battles. With a purpose built tank arena, the best collection of historic tanks in the world, and access to some of the best private collections in the country, Tankfest is widely regarded as the 'Rolls Royce' of military vehicle shows. For more information on the Museum's programme of Tank Action Displays and other special events, see the Museum website or pick up a leaflet to check dates. Waterloo/Weymouth Line to Wool. Wool station is approx 2 miles away with regular bus & taxi service etc. From London and South East: M3/M27/A31 Bere Regis/Bovington. From Exeter: A35 Dorchester/A352 to Wool. From Central England - A354 Blandford/Bovington. The Museum is clearly signposted from Dorchester, Blandford, Poole, Bere Regis & Wool.